I don't know what it is I'm making here. I mean, I'm FAIRLY sure it is a sock. 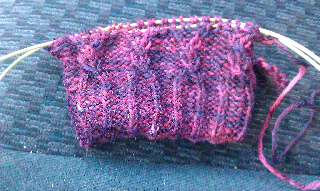 And that there is some knitting through the back loops and it looks like cables decided to join the party. But there is no pattern, or overall "theme," or any semblance of a plan. Except to knit what amuses me, rip it back if I had it, and eventually...there should be a sock. will wait to see the finished project! When I grow up, I want to just take off into knitting unknown, but I'm not there yet. You are so brave!